Are You a Jedi, or Are You Causing a Disturbance in the Force? Unless you’ve lived under a rock—and not one on the planet Tatooine—you know the cinemagraphic tales of the Jedi and their quest to preserve peace in the universe. The success of their mission, like the success of implant treatments, hinges on balance in the Force. A Jedi harnesses the Force for knowledge and defense, but never for attack. Unfortunately, when factors affecting implant success aren’t properly considered, the Dark Side could basically destroy the overall treatment. Put another way, the Dark Side is the potential for Force imbalances to cause peri-implant bone loss and implant prosthesis failure. So what is the Force we’re talking about? According to Merriam-Webster, force can be defined as (1) strength or energy exerted or brought to bear that causes motion or change; (2) an agent or influence that, if applied to something, leads to its acceleration or deformation; or (3) any natural influence that exists that determines the structure of the universe. There are nine forces that influence implant success or failure and that dentists must consider during treatment planning. These include apical, lingual, distal, mesio-distal, occlusal, facial, facio-lingual, mesial, and vertical axis forces. If there is a disturbance in any of these, the dental implants could be prone to occlusal overload. The good news is that you can be a Jedi and apply knowledge of these forces to defend your treatments against the consequences of the Dark Side. Implant force disturbances can occur due to problems with large cantilevers, patients with parafunctional habits/ bruxism, occlusal interferences, and/or poor-quality bone. Limited contacts result in poor force distribution, and steep cusp inclines and increased cusp height equate to bone loss. 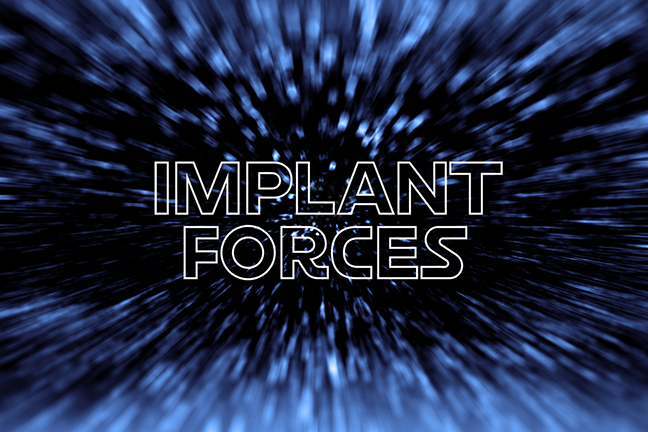 Just like a Jedi must exercise control to better harness the power of the Force, so too must dentists take into consideration and control variables like these that affect implant occlusion in order to ensure long-term treatment success. This means managing Force in the best ways possible; in other words, establishing protected implant occlusion, and much of that depends on implant placement and prosthetic design. Among the recommendations for achieving the best protected implant occlusion are ensuring straight and centered axial occlusal force load; a narrow occlusal table; and reduced cusp inclination, which concentrates forces over the central fossa. The Jedi implant dentist keeps in mind that ideal occlusal centric contacts are loaded as much as possible on the central fossa, avoiding the marginal ridge. And remember, too, that the balance you’re seeking is all about how everything in the implant-restoration complex works together—like ideal occlusal timing and an increased implant surface area, which decreases stress (also known as the Dark Side of the Force). Depending on the case, you may need to create long contact areas by using wider implants and/or splinting implants, which also helps to decrease marginal bone loss, abutment screw loosening, and porcelain and component fracture. Or, you might need to reduce the length of cantilevers or the crown-implant ratio, or decrease anterior guidance, especially since a 10-degree increase causes a 30% increase in loading of the prosthesis and/or implant. If you don’t prevent disturbances in these forces, the stress will impact the abutment and implant neck, causing screw loosening, fatigue fracture, and destruction. The bottom line: Balance in the Force is never by chance. When everything works together, that’s when peace and balance in the universe of your implant treatment occurs. And that’s why it’s essential to communicate with your MicroDental Laboratory technician throughout the implant treatment planning process. Through collaboration, components of the implant-restoration complex can be properly designed to ensure protected occlusion, an ideal crown-implant ratio, and that lateral and sheer forces are avoided. Jerry Hu, DDS, Dr. Jerry Hu is triple board certified in dental sleep medicine and holds masterships, fellowships, and accreditations in implant and cosmetic dentistry. He also has published numerous clinical studies in peer reviewed, highly respected journals such as AACD's Journal of Cosmetic Dentistry, and AADSM's Journal of Dental Sleep Medicine. Dr. Hu also teaches for Modern Dental Group both nationally and internationally, and for Sleep Group Solutions, VIVOS growth guidance appliance group, and Prosomnus Sleep Technologies. He also has won numerous awards in cosmetic and implant dentistry from Macstudio Model Search by MicroDental, and IAPA Aesthetic Eye competition. He is currently working on a patent for dental sleep medicine, and looking to help the US military out in dental sleep medicine.